I wrestled with the decision to read Eleanor Vincent’s memoir, Swimming With Maya about losing her college-age daughter. Did I really want to experience so much pain? However, memoirs about suffering also offer the author’s courage and personal growth, two of my favorite features of memoirs. After I previewed the writing style and assured myself of its quality, I dove in. By the end, I felt fulfilled and inspired by the author’s journey through heart-breaking tragedy to find meaning and dignity. Jumping into the memoir Swimming with Maya feels like an immersion in love and longing. The author’s love for her lost daughter is nearly overwhelming, larger than life, larger and deeper than everything. Eleanor Vincent spends every waking minute torn between the past and her own need to figure out how to move on. The love story of a child who is gone forever vibrates with authenticity and power. During this long period of grief she grabs onto every possible technique to reduce her pain. She attempts to keep her daughter alive by savoring every moment they had together. And since she believes in life after life, she even talks to Maya and feels her presence. In an unusual twist, Maya also lives in the chest of a man who received a heart transplant supplied by the dying girl. Caught by her fixation on her daughter, Eleanor establishes a relationship with this organ recipient and his family. Eleanor Vincent’s grief is made more complicated by fears that she caused her daughter’s accident. Was she a bad mother? What could she have done differently? She feels trapped by these questions. Her obsessive guilt is yet another way she keeps Maya alive, turning their relationship over and over in her mind. She rips herself apart to get to the bottom of why she raised Maya so poorly. This period of self-examination reveals many unattractive aspects of her own life. Her impulses to leave men for no particular reason, to betray men, to move on a whim, put me in an awkward position. I feel judgment rise in my throat. I don’t like these choices. She should have provided a more stable environment for her children. At the same time, I admire her for exploring herself, looking for meaning and answers. This strange bittersweet mix of criticizing her actions and admiring her willingness to examine them provides one of the most profound gifts of reading memoirs. Rather than looking at this clumsy mothering from outside and clucking my tongue in disapproval, I’m inside her mind, with her, trying to figure it all out. To overcome her obsessive guilt, she talks to her therapist about her own childhood. She grew up in an environment as chaotic as the one she gave Maya. Her own history gives her clues about her own bad mothering decisions. Then she dives one level deeper and pieces together her own mother’s story. Her mother too had a chaotic childhood. The story of Eleanor Vincent’s inquiry into her past reveals another profound truth about reading and writing the stories of our lives. Behind each of our stories, are more stories, and as we peel them back and watch the layers fold and unfold, we become wiser about the way life works. This is therapy at its best and soul-searching memoir-writing at its best. The way she peels back the layers of generations puts her in the same category as Linda Joy Myers, Don’t Call Me Mother. Both memoirs offer insight into the multi-generational cause of family behavior. During an epic story such as Lord of the Rings the hero must go through many trials and lessons over a long period. The sheer length of this long middle provides the hero with enough time to incorporate lessons into the fiber of his being. By the end of the story, he is essentially a different person than he was at the beginning. Eleanor Vincent’s journey works in a similar way. She starts out with nothing but the pain and memories of a lost daughter. Then she gradually fills in blanks, while attempting to become a more accepting, wiser person. Her memoir is not only about gathering information. It’s about growing over time. A book with such a profound character arc fills me with hope about the human condition. At the end of Swimming with Maya, I look back across the ground we’ve covered. From gut-wrenching sorrow, the exploration of many bad choices, and the search for new ways of growing, Eleanor Vincent relentlessly, courageously seeks comfort and insight. In gripping page after gripping page, her self-examination raises many intricate responses in my heart and mind. Judgments… compassion… wishing for a better past… working with her toward a better future. Watching her reactions and my own helps me grow wiser about this profound challenge of living gracefully despite death. Madeline Sharples, Leaving the Hall Light On about her survival of her son’s gruesome suicide, and many years of effort to move on. Susan Richards, Saddled is a fascinating journey of a woman trying to find herself. A horse helped her grow. Mary Johnson, Unquenchable Thirst showing her long journey into and through Mother Theresa’s religious organization, Missionaries of Charity. Slash Coleman, Bohemian Love Diaries is about his attempt to find a deeper self. By the end of the book, he is wiser but reveals that he has not completed the journey. After losing a loved one we are hurled into an emotionally pressured period called “grieving.” Words can’t contain the initial shock, so we turn to ritual. After the funeral, our loss moves inside, throbbing as a constant reminder, later surfacing in random moments. Whether we overcome the shock quickly or linger in a demoralized state for years, the world has changed forever, breaking time into parts, before the loss and after. Gradually, we reclaim our strength, but we are not sure if these parts can ever be knitted together. When we first approach our memoir writing project, we look back across the landscape of our lives. Our research awakens scenes, before, during, and after each great loss. Placing them in order, we revisit the whole sequence, from the joy of companionship, through the tragedy of the loss, and the courage to climb back. To turn this sequence into a continuous narrative, we look for lessons from other authors who have done the same thing. Here are several examples of memoirs that describe the journey of grief. Each book demonstrates how to collect the upheavals of life into the container of a story. Gail Caldwell’s memoir, Let’s Take the Long Way Home, is like a love letter to her perfect friend, Caroline Knapp. The book celebrates their friendship and then passionately reveals the journey beyond their friendship. In Gail Caldwell’s beautiful book, death cannot steal such a precious bond. In the first half of Losing Jonathan by Linda and Robert Waxler, the parents try to drag their son back from the brink of addiction, and then after his death, they must come to terms with their grief. 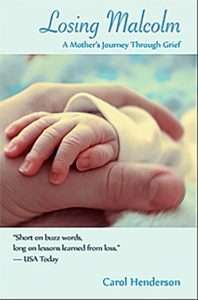 The book offers much wisdom about the role of philosophy, literature, and community support in the journey to cope with loss. At the beginning of Here If You Need Me, by Kate Braestrup, a young mother loses her husband in a freak auto accident. Then she must raise her young children, and at the same time make peace with God’s plan. To achieve both goals, she decides to earn a living as a minister. In seminary, she studies the Bible, delving into it not as the final word but as an inspiring source to help her learn and grow. I love her brand of seeking, a mix of organized religion, faith, and real world observation. At the beginning of Year of Magical Thinking, Joan Didion’s husband dies suddenly and she turns her prodigious powers of observation on herself, describing the resulting thoughts and feelings. Unlike other writers in this list, Didion did not reach toward a spiritual system or a belief in the transcendent. The absence of this dimension turns the tragedy into a barren ache that leaves me feeling helpless in the face of mortality. Generally the word “grieving” describes the journey of recovering from the loss of a loved one. Similar emotional repair is often needed after losing anything we love. After the tragedy of 9/11, we realized that normal life could suddenly explode and turn into a nightmare. Our sense of safety was dead, and we had to find our way back. Dani Shapiro’s memoir Devotion is about her journey to recover from both types of loss, the death of her father years before and her need to make sense of the fragility of life. She explores that sadness, and the need to make sense of it, not only emotionally, but more importantly, to find belief in something greater than herself. In “Devotion” the process of grieving becomes intimately related to the process of seeking a higher truth. There is no particular time frame around grieving and in fact the process can be substantially delayed. When my brother died, I was in the middle of a confusing period of my life. I did not process my feelings about him until thirty years later when I saw the whole sequence come to life in the pages of my memoir. By writing, I was able to feel a closer connection to him and deeper understanding of my own feelings. In the development of my memoir, I also saw how his death shook the family and how each of us came to terms with it in our own way. Decades after my brother’s death, my father still appeared to be shaken. Like other men of his generation, he remained silent about his emotions right up to the end. My mother on the other hand, went on a journey of self discovery. She learned from yogis, rabbis, television preachers, and books. Over the years, I watched her grow. Even as she became wiser, she was never satisfied and continued to learn. What loss have you touched upon in your memoir research? Write a scene before the loss, when you felt an innocent, joyful sense of connection. Write another one soon after the loss, then several more scenes later, as your emotional response evolved. Set these scenes out on a time line, and graph the ups and downs of one of your emotions. Try hope for example, or faith. Fill in additional scenes along the line to offer you and your reader a richer understanding of the evolution of this emotion over time.